After enjoying our time at the Fantasia Gardens, I had really wanted to go to the Polynesian Resort for some much needed lunch. We waited at the Swan and Dolphin docks again. I thought the best route was to go to EPCOT by boat and get to the Polynesian somehow through there. Once on the boat, I realized that I had made a terrible mistake. The friendship boat would definitely take us to EPCOT. However it would take us tot he back of EPCOT...no busses, no monorail. Upon making this realization aloud, another friendly couple suggested we get off at the next resort stop and take the bus to EPCOT. Upon docking, we power walked (look...we were really hungry at this point) to the Beach Club Resort and found a bus that would take us to EPCOT. Once we got to EPCOT, we decided to take the bus again to the Polynesian Resort. We waited about 20 minutes and had a great conversation with a cast member, who turned out would be driving us to our destination. Once we arrived, we ate at Captain Cook's and continued to plan out the rest of our day. Unfortunately those plans never flourished. Whatever I ate did not sit well with me and we had to make our way back to our resort. We decided to take the monorail (my husband with a dole whip in hand from Pineapple Lanai) to Magic Kingdom and take a bus back to the All Star Music Resort. At dinner that night was when Gus and I realized that we had visited all four parks and used each mode of transportation offered by the Walt Disney World Resort. Its a memory we'll always have. So what about you? 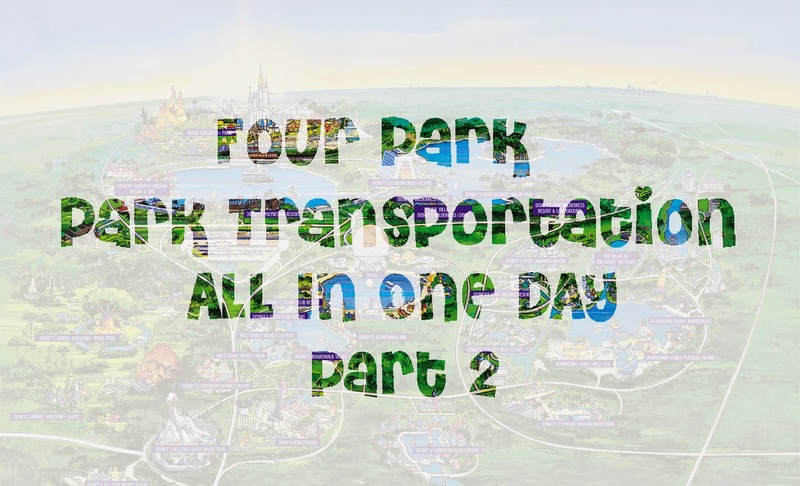 Have you been able to visit all the Walt Disney Parks in one day? Tell us about it below!